The maps I walk with are usually 1:25000 “Explorer” scale, and you can usually get great deals on these from online from Dash4it.co.uk, but the waterproof “Active” ones will still set you back nearly a tenner. You can get the normal paper ones more cheaply, but without a mapcase they’ll become almost useless in the first bit of rain. And, inside a mapcase, the same will happen when you inevitably need to re-fold them in a downpour. If the mapcase doesn’t strangle you in high winds first. But… the “Active” maps are heavy, at over 200 grams each. And more often than not, you’ll need more than one on a walk. Moel Siabod sits across two maps, while the area around Pumlumon really needs three. You’ve now reached the point where your maps can weigh more than your tent. To get round this, some people cut up the big maps into handy A4 sizes and laminate them. This fixes the weight problem, but the laminated maps don’t last forever (particularly if you fold them) and you can still end up shuffling a deck of them if your route doesn’t fit nicely into the chunks you cut up. I’ve been using Mapyx Quo digital mapping on my PC for a while, and while it’s an ideal way of planning routes at home, it’s also great for printing customized, lightweight maps to take on the hill. Cheap to get started, too: the software is free and you can download individual 10K x 10K ’tiles’ for £2.25 each, with no minimum order. While that’s expensive compared to a paper map, you only need buy the tiles you need, and you can print from them as often as you need. Most day walks will fit comfortably onto a single A4 sheet at 1:25000 scale. Adjust the Position and Width & Height to get the best fit to your paper without clipping. Turn Grid on – this ensure you’ve got grid square numbers on the map edges. Reading map references is impossible without this. Set Sharpen to 1 or 2. This radically enhances the visibility of contours and other fine detail. 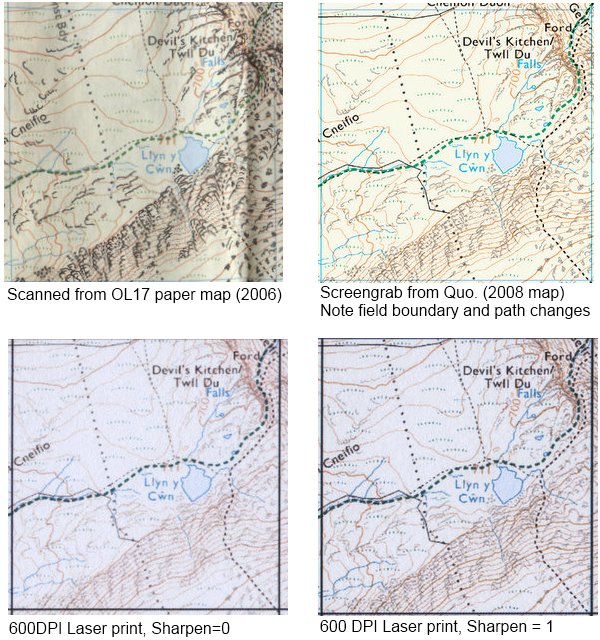 Experiment on normal paper, but use Toughprint Waterproof Paper for the maps you take with you. It’s truly amazing stuff. You can fold it in quarters and stick it in a trouser pocket, and reuse the map over and over without it degrading significantly, even on the creases. Alternatively, an A4 laminator is cheap, but the laminated maps are difficult to fold and can delaminate around the creases. If you need multiple sheets, print your maps double-sided. If your route needs more than a single A4 page, make sure your sheets have a decent amount of overlap. Check the map prints at the right scale, by measuring the gridlines on the paper. If this is wrong, you’ll get inaccurate grid references when using your romer. Make sure your printed area includes any escape routes and enough area outside your intended route. If you wander off route, then you’ll still be somewhere on your map. Use the best resolution your printer can manage : 600 DPI is ideal for laser printers. in my pack (light, waterproof and generally great) or have Viewranger 1:50K OS mapping on my mobile. Sharpening the print makes a huge difference: This image shows scanned prints with and without sharpening, and a scanned OS map and digital ‘screengrab’ as comparison. The resolution of the digital data provided by the OS means you can never print as good a map as they can, but you can certainly make acceptable ones. You’ll also probably spot that the older 2006 paper map is subtly different from the newer digital data. OS have reduced the darkness of cliff and crags, which makes the contours easier to read, and also added boundary walls and fences which were bizarrely missing. The path up to Y Garn (off to the north) has also been significantly changed. All good reasons to make sure your maps are up to date!